As Ukrainian nationalists increasingly try to force members of the canonical Orthodox Church into joining the self-proclaimed “Kiev Patriarchate”, the violence of the 1990’s against Orthodox clergy is being repeated in western Ukraine. As before, the Ukrainian Greek Catholics (Uniates) are involved in what they perceive as a “nationalization” of Ukrainian Orthodoxy. This news of a church in the Lvov region is only one example of a frightening trend that is growing in post-Maidan Ukraine. While English language religious news services have been quick to cover the incidents in eastern Ukraine against Pentecostals or other sects imported from the West, this alarming violence against the only canonical, native Church in the Ukraine is remaining somehow unnoticed. Patriarch Kirill of Moscow and All Russia has addressesd the U.N. and other international agencies concerning the danger, but the uncanonical “Kiev Patriarch” Filaret (Denysenko) has accused Patriarch Kirill of lying. 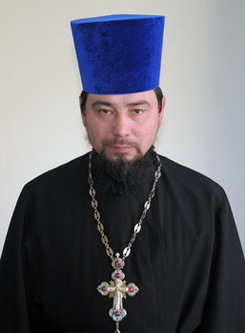 In the town of Turka near Lvov, Ukraine, a group of fifty athletic-looking men, with the support of the local police, have forcibly seized the Church of the Protection of the Mother of God, Ukrainian Orthodox Church, Moscow Patriarchate, as reported by news agencyInterfax-Religion, citing the Russian website National Control. In the process, the priest of the church was physically injured, the church closed, and the parishioners forbidden to enter their church. According to information published by the agency, some of the attackers were Greek Catholics (Uniates). 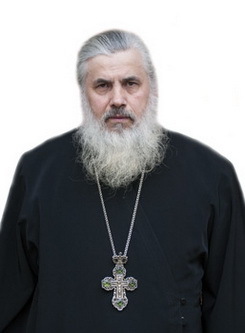 On June 29, 2014, when Archpriest Alexei was performing the church services, a group of ten supporters of the “Kiev Patriarchate” broke into the church. The mob was headed by several former militant Communists. The ruffians ran onto the ambo (the raised area just in front of the sanctuary doors), attacked the priest and threw him to the floor. Afterwards, court medical experts recorded bodily injuries to the priest. 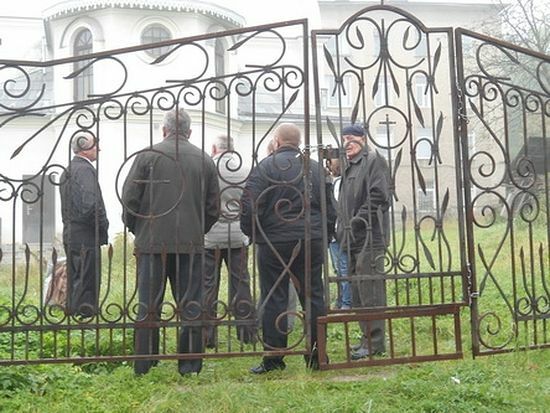 Again, only recently on September 28, 2014, a group of fifty people (including town businessmen and strong men of athletic appearance) broke into the church’s territory and forcibly seized the property, . They locked the church and closed all access to the church property. The parishioners were particularly shocked by the fifty-strong police force specially sent to the church. Instead of defending the faithful and clergy from this criminal attack, the police simply stood by indifferently watching events unfold. The Orthodox parishioners (300 people, mainly old men and women) tried to get through and open their church, but they were met with tough resistance from the usurpers, and… the police. Even more remarkable was how the police stood on the side of the attackers and accused the parishioners of provoking a “conflict”. No pleas or arguments from the Orthodox citizens to the municipal authorities were of any effect, regardless of the fact that the parishioners had all the necessary legal documentation: the certificate of registration of an Orthodox community, and right of ownership for the property. The parishioners of the church testify to the fact that the majority of the muscular men had never attended services in that church. The same evening, when the faithful came once more to their church for evening services, no one was permitted to enter the church territory—neither the parishioners nor the clergy. They smashed Hieromonk Vladimir’s (Kozanchin) face. People were horrified to see the priest covered with blood. Further, one of the usurpers raised his arm against the priest and threw at him a bottle filled with water that he had prepared for the attack. 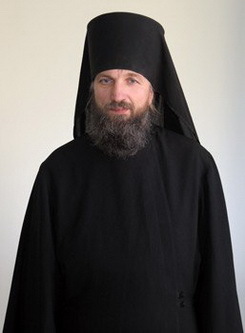 As a result, Hieromonk Vladimir’s (Kozanchin) face was smashed. People were horrified to see their priest covered with blood. The Orthodox began writing claims concerning the attacks. Because the attacker smelled of alcohol, the faithful demanded that the police conduct a medical investigation of the ruffian for alcoholic inebriation. The police, however, categorically refused to do so. Today the situation remains extremely tense, and the seized church is locked. The faithful are not allowed to enter it, and are continually threatened and intimidated. On October 1, 2014, the parishioners made a complaint to the Lvov Regional Sovereign Administration, but their complaint was not accepted. Two weeks prior to this incident, arsonists attacked the monastic skete where Hieromonk Vladimir (Kozanchin) lives. One of the buildings was set on fire, and its second floor and roof were burned. The criminals were not hindered by the fact that this skete is being built by the widowed priest Yaroslav Yavorsky, who was left with six children at his wife’s death. Fr. Yaroslav’s wife died of cancer, and he began building the skete with what money he had. According to the latest information, representatives from both the “Kiev Patriarchate” and the Greek Catholic Churches were among the attackers. Today Orthodox Ukrainians are seriously concerned about the beginning of new persecutions against their Church. This concern arises despite the fact that the new Ukrainian government is trying with all its might to declare its allegiance to Western democracy, tolerance, and support for religious freedom. But the ironic twist is that almost all the Orthodox priests being subjected to persecutions are themselves native Ukrainians. In accordance with Orthodox Church liturgical practice, priests of the canonical Ukrainian Orthodox Church pray daily at the services for the civil authorities of Ukraine, and the majority of the parishioners are likewise native Ukrainians. But this does not at all stop the vandals from attacking Orthodox churches and their parishioners. If these facts of religious discrimination and openly criminal attacks, supported by the authorities and police, become known to the European Union, international defense agencies may be called in to resolve the conflict. And then, even the European officials loyal to the new Ukraine may unavoidably have to ask unpleasant questions of the authorities in Kiev and Lvov, who are allowing such religious intolerance and openly criminal acts against the faithful, writes National Control.